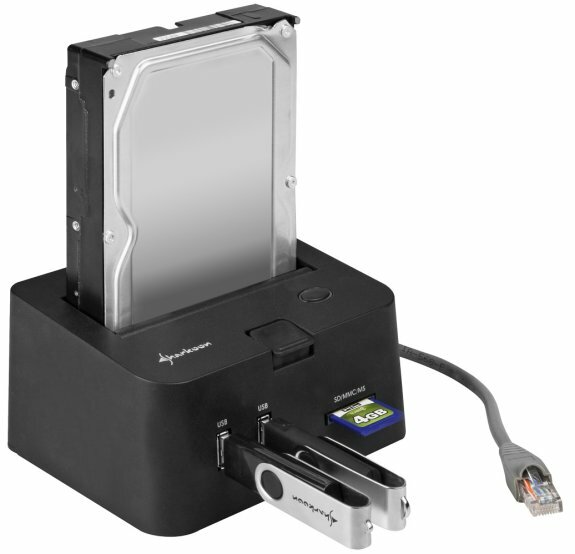 Sharkoon introduced the SATA QuickPort Pro LAN Giga, a new HDD dock with Gigabit Ethernet interface. The device supports 2.5" and 3.5" SATA HDD/SSD devices, and also offers eSATA, a USB 2.0 hub and SD/SDHC/MMC/MS memory card reader. It will be available in Europe for 59.90EUR. Sharkoon presents the successor to their local network, insertable hard drive docking station with the SATA QuickPort Pro LAN: The Sharkoon SATA QuickPort Pro LAN Giga replaces the existing Fast Ethernet interface with a significantly faster Gigabit Ethernet interface. Through its LAN Port, associated hard drives and other medians can be integrated into a local home or office network. In addition to the LAN Port and plug-in for SATA hard drives in 2.5 and 3.5 inch format, the Sharkoon SATA QuickPort Pro LAN Giga provides an integrated dual USB2.0 hub and a card reader for SD, SDHC, MMC and MS cards. The USB hub and card reader are connected via USB to a computer or laptop, with hard drives also being connected alternatively via the eSATA interface. In order to ensure that all inserted SATA hard drives, memory cards and USB devices within the QuickPort are available to all users of a local network, the docking station must be connected to the network with the corresponding software installed on all computers involved. The individual user can add the device to their computer through the Software menu. If a user accesses the device then it is closed to all remaining network users. If another user needs the device, they can simply send the current user a request for release. If needed, the reset button on the backside allows the USB server to be restarted. Like the previous QuickPort models, the Sharkoon SATA QuickPort Pro LAN Giga is equipped with a hard drive ejection button and LEDs indicating power supply and disk activity. The adapter measures 133 x 71 x 95 mm (W x H x L), weighs 545 grams and includes an instruction manual with Tool CD, power supply, patch cable, USB cable and eSATA cable.